You may have read our review on the Schuberth C4 helmet. Well, now you have the opportunity to read what we think about the SC1 Advance Communication System. Firstly, I would like to thank Pete from Just Helmets, a UK motorcycle helmet supplier, hosting large stock of all styles and sizes, for helping me get the helmet, and consequently the Bluetooth, as soon as it became available on the market. It should be made clear that like the Schuberth C4 helmet, I consider the Communication System SC1 Advance to be top spec. This review is based only on my own experience using this product. I have been using the SC1 for over 5 months now and I have covered over 6000 miles with it, using it on all sorts of roads and in all sorts of weather conditions. The main reason why I bought the C4 was actually for the communication system. I wanted something that could fully integrate into the helmet with no units showing on the outside. However, I was not prepared to compromise on the performance. Having to order the helmet without seeing it or without any other information other than that provided on the manufactures website, I began to research Sena who manufacture the SC1. After all, if I bought this helmet I would have to buy a Sena unit for Natalia. As previously mentioned in my the C4 review, the helmet arrived in impeccable conditions; displaying its quality and luxury from the moment I opened the box. The comms system was no different. A perfect, tidy box glistened in its packaging, waiting to be opened and reveal the jewels inside. All very well presented and carefully packaged, the box included a small booklet with instructions, the battery, the controller and a small tool to remove the controller from the helmet. My first move was to open the booklet in order to learn how to install the device, into my brand new C4 – the last thing I wanted was to damage the helmet or the Bluetooth due to an incorrect installation. I must admit, I found the device extremely easy to fit into the helmet. It fitted perfectly; you can tell Sena and Schuberth have been closely collaborating to create this. The SC1 is easy to use, with only two buttons needed to use all the functions. The Sena App is also available to download free of charge, which helps when configuring the advance settings; a graphic interface is always welcome. The device can be configured by using either the App or by using the built-in controls. Despite both being intuitive and quick, I personally recommend downloading the App on your phone as it also allows you to update the software of the device. Once I got my head around the main functions, I decided it was time to pair all the devices. I paired the SC1 with my BMW Navigator VI, iPhone 7 and Natalia’s Sena 10S, with no trouble. The two devices connect extremely quickly when one begins the conversation, there is hardly any waiting period. The sound quality is also brilliant when using the intercom mode between both Sena devices. Even at speeds of 70mph on the motorways you can maintain a conversation with no trouble, with speech being heard clearly and volume being lowered or raised easily. However, this is not the case when using the group intercom function. If for any reason the normal intercom failed, we were forced to use the group intercom mode. This mode, specifically designed for groups up to 4 people, can also be used with just one other person. The problem with resorting to the group intercom mode, with only two people connected, is that the sound quality is really disappointing. There is a lot of muffling and background noise which makes it almost, if not impossible to speak to one another. Additionally, this mode only works in very close distances. Both these intercoms have working distances up to 1.0 miles (1.6 km) in open terrain. Sadly, this is something we haven’t been able to prove. A connection can be established at distances of approximately 200 yards and once the conversation is on, the distance can increase up to about 300 yards. When trying to initiate a conversation being further apart, you received a very annoying message: “Intercom failed, try again later!”. One of the main reasons I bought this helmet was because of the Bluetooth and its range, I am quite disappointed by this. Using the SC1 with my phone and my SatNav is simple and easy. Once the Bluetooth is on it connects to both devices routing the audio through. The sound quality during phone calls is extremely good. However, when receiving navigation instructions, the quality is not that good, it cuts between instructions sometimes and it is not clear. Overall the SC1 is a good Bluetooth device. But, is it worth £284.99? My honest answer is no. I was expected much more from it. I expected better range, better quality in group intercom mode and better quality when receiving instructions from my SatNav. Bearing in mind the Bluetooth and its integration with the helmet is what made me buy the Schuberth C4, I am rather dissatisfied. They both cost a lot of money and now I cannot fit another Bluetooth in it as the helmet has all the speakers and microphone for this device only. I hope Sena will release software updates for the SC1 to fix the issues I am having. Check our Twitter and FB pages for further updates on the SC1 performance after updates. If you liked the review, let us know about other things you would like to hear about. We’ve had no trouble, and have been using them for a few years. Sometimes lose contact briefly on bendy roads if we’re not together, but that’s about all. I had a number of C3 & C3 Pro. Apart of being the quietest helmets available their quality is not to par with their reputation. After a few months the visor can’t stay in open position and the SRC usually breaks down in a form or no more able to be charged or turn on. I thing I had enough of Schuberth. Next helmet will be non-Schubert. Thanks for the review … I have shared it also on Tour On 2 Wheels as I can very well imagine your assessment of the Schubert / Sena device. I had been searching whether I would replace my current Schuberth / Cardo unit in my Schubert C3 Pro with the Schubert / Sena one as I do not think the Cardo one lives up to Schuberth’s brand image completely. My use is more solo and 2 functions I mainly use: FM-radio plus Bluetooth connection to my Garmin Zumo 660. I regard the quality of my current Schubert / Cardo unit better than what I had before being a Nolan helmet with n-com communication set. The integrated antenna in the helmet makes a difference, but it is less of a quantum-leap then I expected it to be. 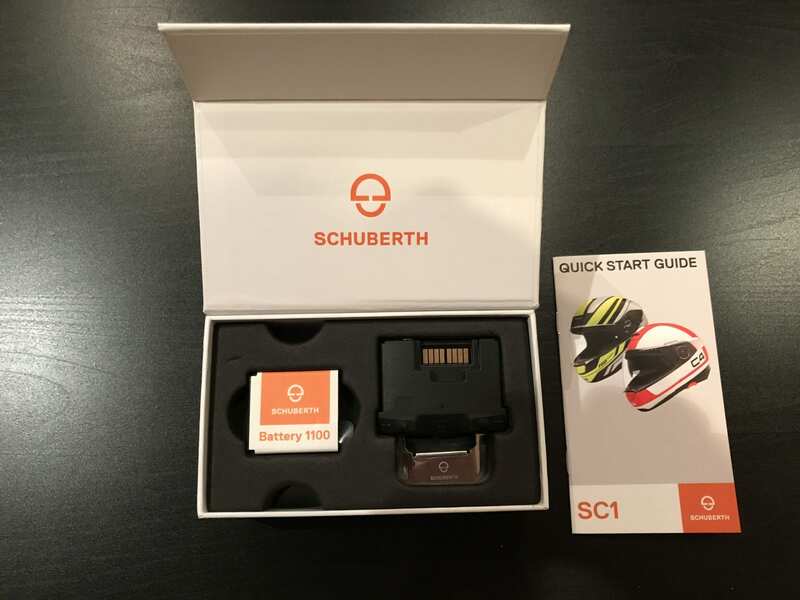 I regard Schuberth’s support as very good: when I had issues with my Cardo unit, they did do the additional mile (maybe helped by having a blog on motorcycle related topics). I understand Christos view on Schuberth. I did expect more from my Schuberth gear when I made the switch from Nolan, so for my next helmet it will for sure not be an automatic choose for Schuberth. Christos: I can advise you to make direct contact to Schuberth support in Germany … I had very good experience with it, and maybe you too if you give it a try. More have reported to have been helped well when having to send in their helmets / communication kit. We will give that a shot and contact support. Let me start with saying that I was very happy to know that finally Schuberth and Sena worked together to perfect the experience of riders with the all new Schuberth C4. I loved the idea of the integrated system within the new helmet and I couldn’t wait to test it this weekend. Let’s start with the charging port on the unit (Micro USB)- it is very difficult to hold the helmet in one hand and with other hand insert the male port while trying to have the port cover open. You need to have the helmet upside down on a surface and careful not to scratch the helmet. But that is not the only design issue. The biggest issue is that you will not be able to leave the helmet seating on a surface to charge as the design and location of the port might cause the port to damage or disconnect as it pushes against the surface. Wrong place for the port! At first, all was great (beside my wrong configuration of need to speak load to open intercom connections- my throat hurt after today ride. I connected my SC1 with my wife SRC on Schuberth C3 Pro and my NAV V. Nice at the beginning, no issues. Then the problems start: if my lid was open, I could not initiate connection with voice command because of the microphone location, so lid must be close all the time. Most of the time, my wife could not understand what I say and I had to repeat over and over, loader and loader (we use her helmet with my Arai XD4 with Sena SMH10 and no issues at all). From time to time she told me I sound like inside a jar or muffled. In many occasions, I saw message on my NAV V: Bluetooth disconnected (and I still could hear instructions from the navigation). In some other instances the navigation voice commands cut off or sound not clear at all (like you hear when you have bad wireless connection on your phone). Now, let’s talk on buttons functions: very hard to use it with gloves on, almost not possible at all! Charging indicator: light is not easily visible if you look at the helmet from the side. You need to always lift the helmet and look at the inside of the helmet and look for the color. Frankly, I am very disappointed, I chose the helmet because of the SC1 system (as I was looking at different helmet for a while). I hope you going to improve it soon and come with SW version updates that will improve connectivity, sound quality and sensitivity. At this point I rate the SC1 with 2 stars out of 5. Please do something to correct it. Thanks for sharing your experience Eitan! I can tell you are disappointed with the product as well! Let me scratch line with saying that I was very happy to jazz that finally Schuberth and Sena worked together to perfect the experience of riders with the all young Schuberth C4. Any updated reviews on this one due to new firmware perhaps? Seems to me like most of these issues should be easily addressed by software updates. Thanks for any input as I am considering the system for my recent C4 purchase. I am afraid there haven’t been any updates yet! The helmet is still brilliant! I just find I have to adjust the pinlock quite often but this happens with most of the helmets. There’s apparently a new v 1.1 update out now, any chance for an updated review? Really mostly interested in the bluetooth functionality (navigation->helmet, music->helmet), and seriously considering the C4 & Sena, but my god, the reviews seem to absolutely slaughter it. I will write a comment if I notice any change. I will test the new version and the SC1 advance I April while in a 2000 mile trip and I will share my experience. I hope things change. Hi Iñigo, have you had the chance to test the new firmware? I am going this weekend for a long trip and next weekend I will test the bike to bike functionality so will have some feedback in a couple of weeks. Sorry is taking this long! So! Finally got around to test the SC1 with the update. And I have to say… I haven’t notice any improvement! I have used it connected to my Sat Nav for directions and music only. I didn’t have a problem with these features before to be honest so I haven’t noticed any improvement. We have a trip planned in Easter and will be testing it during 5 days so may have some updates then as the main problem I found was when using the intercom with another bike. The speakers on that helmet is cheap. bluetooth system is a rip off. i bought 4 pcs for our group and we are very disapointed. We use it between the both of us and the volume is good. Even with earplugs I can hear Music, GPS and other people clearly. Maybe there is something wrong with yours?